I’ve finally blogged my way through my last UK/Spain trip (although, sadly, as I write this, I’m already starting to pack for my next UK trip). After two weeks of more eating and drinking around London, we had to get up fairly early in the morning and catch our flight out of Heathrow. Being 7:30 in the morning, we decided that this would finally be a good opportunity to check out Pimlico Fresh, which is just down the road from my brother’s flat. We’ve walked by many times on the way to/from the local Sainsbury or Victoria station, but had never been inside before, since the place is usually packed to the rafters. But at 7:30 in the morning? No problem. We walked in right as they opened. 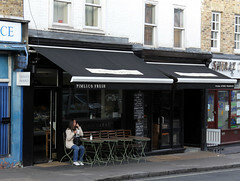 The interior of Pimlico Fresh is rather pleasant, with the overall motif being that of large wooden tables and chalkboards (those of you that have been to Le Pain Quotidien will find the decor familiar), with most of the seating being at a large wooden table to the right as you enter. Like the large table at Monmouth Coffee with the bread and butter, I’ve often walked by this table with no hope of ever getting a seat. That’s most of the seating, hence the typical wait to get in. 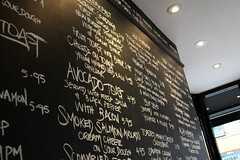 After a few minutes looking at the extensive menu board, I decided to get a cappucino (using coffee from the above-mentioned Monmouth) and one of my favorite simple English breakfasts: cheese on toast. I’ve always enjoyed cheese on toast, for several reasons. First, it’s the exact sort of savory breakfast that’s very difficult to find in the United States, primarily due to the American tendency to find a way to cram eggs into just about every breakfast. I’m not the greatest fan of eggs (although I love a good Mexican-style huevos, or a proper Eggs Benedict), so there’s always some I love about the simplicity of a little bit of cheese sauce on some toast. Get some good crusty bread. Mix up a few cheeses and add a few flavoring spices and sauces, like a good mustard, and you’ve got the right amount of cheesiness and tang. Now take that and make sure that both the bread and sauce are properly toasted (a light toast, with a firm presence of the Maillard reaction, but not enough to give the bread a sandpapery texture), with the entire top and bottom of the bread toasted while the interior is still soft, and just a hint of charring to the cheese, and you’ve now got a wonderful texture to go with the flavor. When well done, it’s one of my favorite breakfasts. 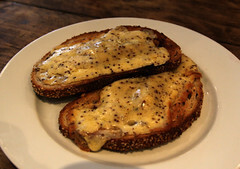 Well, my cheese on toast from Pimlico Fresh was indeed an excellent example of a dish well done: perfectly done multi-grain toast topped with y fenni mustard and ale cheddar. I enjoyed every little bite of this dish, and am still hoping that it’s on the menu the next time I’m in Pimlico (less than a week now). I’m going to make it a point to rise early just to go back.